Here’s some helpful information from, “Ask Well.” Health questions answered by Times journalists and experts. 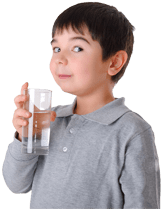 Using the right water filter can help further reduce pollutants like lead from old water pipes, pesticide runoff in rural areas and byproducts of chemicals like chlorine that are used to treat drinking water. Radon, arsenic and nitrates are common pollutants in drinking water, and trace amounts of drugs including antibiotics and hormones have also been found. Certain filters may help remove these impurities as well. You can then choose a filter that is certified by NSF International, an independent public health organization that assesses products. (All friendsofwater filters are certified).